Uh oh, I found another computer game. I already have far too many demands on my time, and then I stumble upon Distant Worlds, a space grand strategy wargame. Back in the 90s I fell in love with a 4x game called Stars! There were essentially no graphics to it, but the game was about the strategy, not the graphics. You explored the galaxy, sent out ships to colonize other planets, built up an economy while fending off attacks from alien races, and ultimately exterminated them to rule the galaxy. 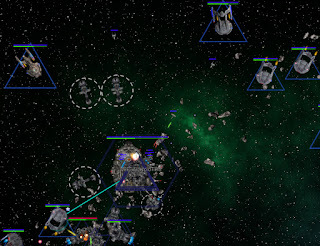 Long after I had abandoned many other games, I kept coming back to Stars!. 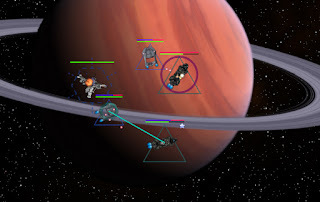 There was a planned sequel called Stars: Supernova Genesis, which was billed as an improvement with the addition of cool graphics, but it was abandoned, and I was heartbroken. There were other games out there, most notably the Master of Orion series, and I took a look at them, but then did not quite hold the appeal to me as Stars! did. But then I found Distant Worlds, it seemed to have inherited many of the things that drew me to Stars!. (Yes, Distant Worlds has been out for a while, but I play few games in general, so I was out of the loop). I like that I can automate some things and micromanage others. I love the fact that I can name all my own ships, and even better, the game is intended to be easily mod-able, so I can substitute the stock images of ships with anything I want (which is good, because some of the ship designs are...blah). My frigates (modeled after Star Trek TNG's Steamrunner Class Starships) defend a mining station from pirates. The game is intensely addictive. I've started a handful of games and gotten into them, and so far I've been leaving much of the work up to the computer (you can essentially automate everything). My problem is that I keep wanting to expand that I'm not taking proper time to optimize my decisions. I've come to the conclusion that I want to start over, keep track of things better, and do this methodically. One of the areas in which I think the game could be improved would be with an in-game journal of some kind, so a player could follow the history of their empire. There is a message log, but it gets cluttered awfully fast. My fleet attacks a pirate base. In addition to the Star Trek vessels, if you look really closely, some X-Wings and Y-Wings are in the mix. Why? Because they're cool. Of course, a blog is the perfect venue for this sort of thing. So I think that I'm going to start a blog series of my progression through the game. I've looked at a few strategy guides for the game, but I've deliberately avoided looking too closely at them, as well as avoiding looking too closely at the plot. I think that my experience of the game, as well as its presentation here, will be cooler if I have to experience a learning curve as I progress.